Durable is an office supplies manufacturer that has risen to the highest ranks among German brands and is celebrating its 90th year in operation. At Durable, we believe in taking responsibility for our choices and fostering stewardship. Durable products are especially good because of their durability. Our high quality standards enable us to produce outstanding consumer items that are built to last, thus requiring less frequent replacement. The Durable Desk Pad with Annual Calendar is a great way to keep track of the date at a glance. 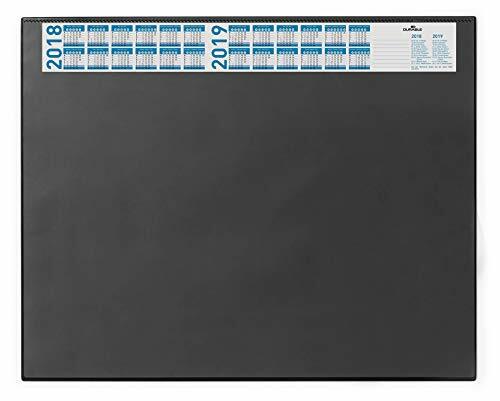 Each calendar shows important dates and holidays and is accompanied by a flexible transparent overlay welded at the top edge which provides a comfortable and firm writing surface and is ideal for keeping notes, messages and single sheet documents at hand. There is a soft, anti-slip backing which protects your desk and stays firmly in place. At Durable, we continue to seek ways to offer consumers the highest quality products, and, at the same time protect and preserve the future of Mother Earth.